Wishing Well. Classic Water Well or Wishing Well with wooden bucket. O-Scale. Fully assembled and weathered in various colors (brown, black, rust and green). 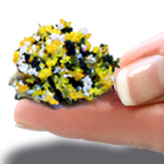 Small Yellow Border Plants - Set includes 8 yellow flowering plants each measuring approximately ½" in diameter. Plastic leaves and colorful petals on transparent base. Small Pink Border Plants - Set includes 8 pink flowers each measuring approximately ½" in diameter. Plastic leaves and colorful petals on transparent base. Small White Border Plants - Set includes 8 white flowers each measuring approximately ½" in diameter. Plastic leaves and colorful petals on transparent base. Purple Lilac Hedges - Multi-Scale**. Vibrant green hedges covered with brilliant clusters of lavender flowers. Two flexible hedges measure approximately 8" long x 3/4" thick x 1" high. Hollyhock Set - A flowerly plant cherished by ancient nobility and often referred to as the "Emporer's Staff". The Hollyhock set contains three flowering plants situate on a base of creeping ivy. (Flowers may vary in colors). The Garden Pond is beautifully detailed with a variety of decorative plants, vines and shrubs including yuccas and clematis "Queen-of-the Vines"! Each Pond has an approximate entire circular measurement of 3½" x 3". The pond alone has a 1½" diameter. Victorian Garden Pond is bordered on the back with a rustic wooden fence, embellished with a variety of decorative plants, vines and shrubs. Measures 5½" x 4½"